Wandering the calles and campos of Venice where a good photograph lurks around every corner, I sometimes have trouble dragging myself inside. But on my last trip to Venice, I made a special point to visit the Gallerie dell’Accademia -- or Academy. Why? 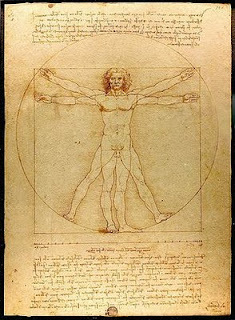 Because Leonardo da Vinci’s “Vitruvian Man” was on display, a rare and extraordinary opportunity. So, off my husband and I went in search of the “Vitruvian Man,” and he did not disappoint. Currently much of the Academy is under construction, so a few key rooms and pieces I’d been looking forward to seeing were off limits. But, there, in a little alcove off a hallway, was a glass box containing what looked to be an 8.5 x 11” piece of paper. We sat and waited for the room to clear out as a British family crowded up close to the glass case. Mum and Dad tried to convince their preteen son and his younger sister that the drawing was worthy of more than a passing glance, but they weren’t buying it. But when the family left, there we were... alone with the “Vitruvian Man.” Da Vinci composed the drawing based on proportions described by Vitruvius, an ancient Roman architect. Like many of his contemporaries, da Vinci was devoted to the writings of the ancient Greeks and Romans, and he applied the principles of shape, proportion, and form in both his artwork and his scientific life. Standing before the sketch, I had to catch my breath. This image... the male figure within the circle, arms outstretched in two positions, legs at two angles... this image I’d seen thousands of times was there before me. I could see the indentations that da Vinci’s pen had made, pressing into the thick paper. There was his handwriting... the tick marks of his measurements... the work of a mind whose genius and creativity I have difficulty comprehending. “The Vitruvian Man” is owned by the Galleria dell’Accademia, but like most sketches it is only on view during special exhibitions. In fact, it has been seven years since it was last shown publicly. The exhibit runs through January 10, 2010, and it is worth making a special trip to Venice to see this extraordinary work of art. Who will love it? : the Accademia is a very accessible museum for those who aren’t museum-crazy. It is small enough to be manageable, and yet its collection has some fantastic examples of Venetian painting. I especially loved Bellini’s Procession in Piazza San Marco. Arrangements: unlike most museums in the world, the Accademia is open on Mondays, a nice plus. Notes: while the Accademia is intellectually and emotionally accessible, like most of Venice, it is not handicapped accessible. Viewing the collection requires climbing quite a few stairs. Fascinating! I'd love to see it. Thanks for sharing about it! HOW very cool. i am envious!! You know I had never stopped to think that The Vitruvian Man would be on display anywhere. Good timing for you to see it.